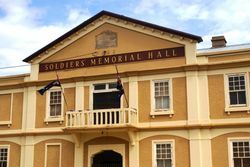 The Soldiers Memorial Hall was originally erected in memory of those from the district who served in World War One. The hall was officially opened in 1925 by Senator Chas Cox. Substantial improvements were made to the hall in 1954. There was a large assemblage at Urana to witness the laying of the foundation stone of the Urana Soldiers' Memorial Hall. 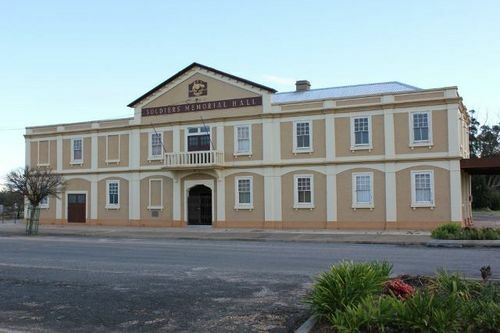 The building will provide a large dancing hall, stage, dressing-room, supper-room, kitchen, library, reading-room, committee room, sample room, and soldiers' club room. The plans were prepared by the shire engineer, Mr. H. W. Hutchings. Mr. F. E. Whitehead, chairman of the memorial committee, presided and the ceremony of laying the foundation stone was performed by Cr. Otway Falkiner, who was presented with an address of welcome and a silver trowel. Speeches were also made by Lieut -Colonel Thompson (Daysdale) and Cr. D. D. Culley, president of Urana Shire. Besides £2,500 promised, another £585 was donated at the ceremony. During the afternoon, at the instigation of Mrs. Otway Falkiner, a branch of the Country Women's organisation was formed, and Mr. Falkiner promised to purchase a block of land and erect thereon a small cottage, to assist the aim of the organisation. Mrs. Falkiner was elected president of the branch, and other office-bearers were also appointed. The Diggers held a ball at night, which was most successful. Albury Banner and Wodonga Express (NSW), 2 November 1923.